Lightweight and tough, the Tuff lite plain offers a huge amount of cutting power in a handy little package. The 2.5" blade offers a razor sharp edge ideal for cutting the toughest materials. The blade is reinforced with a thickness of 2.75mm. Made from durable 8A Australian stainless steel this knife offers a deep penetration and huge slicing potential without damaging the blade. Made from long lasting and comfortable Grivory the handle measure in at 3.5". With small finger groves along the bottom to provide comfort to your hand and keep your finger away from the blade to ensure comfort, this handle fits virtually any hand. 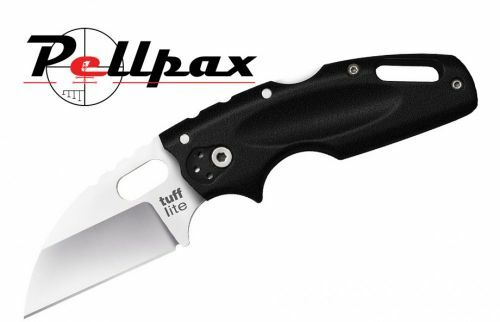 The cold steel Tuff Lite uses a Tri-Ad® lock to ensure the blade is stable during the period of use. To top of this powerful, compact knife there is a pocket/belt clip so you can carry around your handy tool wherever you go.